I quite regularly contribute to an industry magazine. 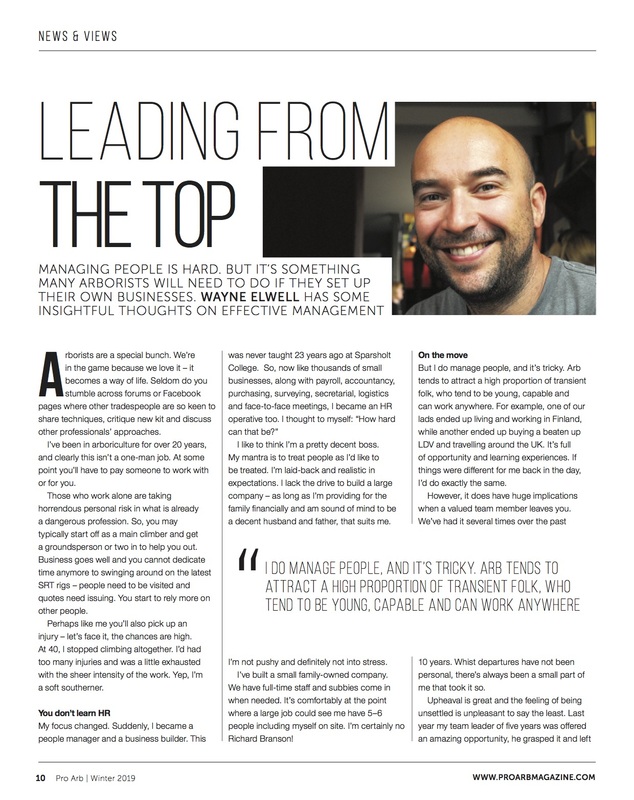 Here is most most recent Pro Arb magazine article about managing people. I’m no expert and have had to learn on the hoof as it were. All tree surgeons NEED a second person. Those who work alone are taking horrendous personal risks in what is already an incredibly dangerous profession. So that’s what you do, you start off as main climber and get a groundsperson in to help you out, sometimes two. Business goes well and you cannot dedicate that time anymore to swinging around on the latest SRT rigs – people need to be visited, quotes need to be typed up, posted or emailed. You start to rely more on other people to do the job you used to. Perhaps like me you’ll pick up an injury (let’s face it chances are high, it’s not the softest job on the old bones is it?) and your climbing career will be ended. At 40 I stopped climbing altogether, I’d picked up one too many injuries and if I’m honest was a little exhausted with the sheer intensity of the hard work – yep that’s right I’m a soft Southerner! My focus changed; suddenly I become a manger of people and a builder of business. This was never taught to me 23 years ago at Sparsholt. So now like thousands of small businesses, along with payroll, accountancy, purchasing, surveying, secretarial, logistics and face-to-face meetings I became a HR operative too. How hard can that be I thought to myself?I like to think I’m a pretty decent boss, My mantra has been to treat people as I’d like to be treated, I think I’m laid back and realistic in expectations. I lack the drive to build a large company, as long as I’m providing for the family financially and am sound of mind to be a decent husband and father that suits me. I’m not pushy and most definitely not into stress. I’ve built a small family owned company, we have fulltime staff and subbies come in when needed. I guess a large job could see me have 5-6 people including myself on site. I’m no Richard Branson! But I do manage people, and it’s tricky. I think the very nature of the game tends to attract a high proportion of transient type folk. They tend to be young, capable and can work anywhere, why would you not? One of our lads for has ended up living and working in Finland, another buying a beaten up LDV and travelling around the UK and so on. It’s full of opportunity and learning experiences. I know if things were different for me back in the day I’d do exactly the same. It does however have huge implications when a valued team member leaves you.We’ve had it several times over the past 10 years. Whist for me these departures have always been well natured and not personal there’s always been a small part of me that took it so. The upheaval is great and the feeling of being unsettled is unpleasant to say the least. Last year was tricky for us, my Team Leader of 5 years got an amazing opportunity thrust at him, he grasped it with both hands and left the fold, I was shocked and spent the next 4 months bumbling around trying to find a replacement. Why he went and could I have done something to keep him is probably a different discussion, but it was essentially down to the desire to try an area in the industry that we are neither set up for or have interest in doing. I do believe that if someone wants to leave it is not my job to convince them to stay if we cannot satisfy their needs, someone on the firm that does not want to be with you is pretty acidic I think. I took this approach in this case, as I always have done, and I fear I did come across non-plussed about the news. Truth is I was gutted. To my surprise it was really difficult to find a full time team leader, I tried my hardest publicising us as company showing all the decent work we carry out, pointing out what a great guy I am, putting jobs ads up on Facebook of us working with cranes, doing big takedowns, heavy rigging – yawn but still it took time. Fortunately we are back on track now, I now have a capable team, decent lads, who get on well with each other, so normal service seems to have resumed. It also has taught me some really valuable lessons. What I’ve learnt is that there are plenty of good people out there. What they often aren’t, are people that do it the way you want it done. You have to build on a firm foundation, work ethic is important as it technique, the rest I think is doable. It’s really hard to relinquish that finished article to someone else, there’s no doubt they will do it different and often better than you would have done. This is where I find BS 3998 (2010) useful, if your new subbie/team member can prune to this you can relax a little. You know the knowledge, skill and good practice is there. No team wants to feel at fault, it’s deeply de-motivating. I think clear concise job sheets can avoid some errors. Sometimes I fear mine are too prescriptive and may come across like I’m patronising the lads or treating them like children- not the case. I do this to protect them on site, mistakes due to misunderstanding of spec. or client’s wishes are down to me. I’d like to think that this makes me part of the team. Don’t get me wrong it’s not a regular occurrence but let’s all be honest mistakes do happen. I don’t think you’d be undertaking this career in the first place. So far so good – there is good people out there, that knock out great work that are hardy and not snowflake(like)The tricky part is managing these people, I was never taught HR. I was trained to be an Arborist, of which I do very little now. How to get the best out of people is hard, what motivates them, what do they love. The answer to the latter I have to say is – not your business as much as you do! This is a harsh realisation but very true, I’m ok with that after all I haven’t loved my ex bosses companies in the past. I find myself feeling a little bit paternal to the team, I want them to know I have their back, just as I’m exposed letting them be the face of the company, I’m also there for them. I’ve had people before with personal problems at home, difficult family life, tricky ex girlfriends and I’ve tried hard to support and understand. In the past I’ve enjoyed the fact that I’m a Boss and have lads on site to do the hard work. I’ve rocked up in the morning issued the job sheets and left the them to it, truth is whilst trying not to interfere with their way of running the job it just comes across as me not being interested which is far from the truth. My desire to not micro-manage, constantly be calling for progress reports or be Alpha male had been conceived as me just not giving a damn. This is easily changed; I started to go out on site with the team more often. Yes I got under their feet and tried to impart knowledge (that they already know) but at least on those days we are all in it together. I also realised how much of the banter I’d been missing. We also try to have regular tool-box talks. Whilst a bit American and touchy feelythey are really beneficial – team members feel valued and able to raise concerns regarding kit, jobs, timescales etc. Getting subbies in brings a whole new ball game. In truth I feel for sub contractors, these people work HARD! Face it, you’re paying your subbie easily upwards of £160 per day, you’re going want you pound of flesh. I’ve tried to resist this urge, generally they do come in on larger jobs, and so it’s very nature is that these are harder days in fact the whole team works harder on these days. The reason you pay them more? No holiday, no sick, no pension, their PPE, their tools and so on. That’s their risk not yours. It’s not an excuse to load them up. When they are working with us they are part of our team, not some pit pony to be worked and worked and worked. This approach has worked for me, subbies want to come in for me, they’ll change stuff around for us in their diaries and my view is work more conscientiously for us. My experience has shown subbies to be amazing professionals who perform day in day out, learn how different companies work and adjust accordingly, they are worth the money, treat them well. Some may say it’s crazy but when we have subbies in I’m quite happy for the whole team to job and knock. Eye catching figure that isn’t it? It doesn’t refer to About Trees Ltd. being the 4th largest in the country in terms of tree care, although we do think big. It’s to do with our latest job on the estate of the 4th largest in the country in the world of grape growing. 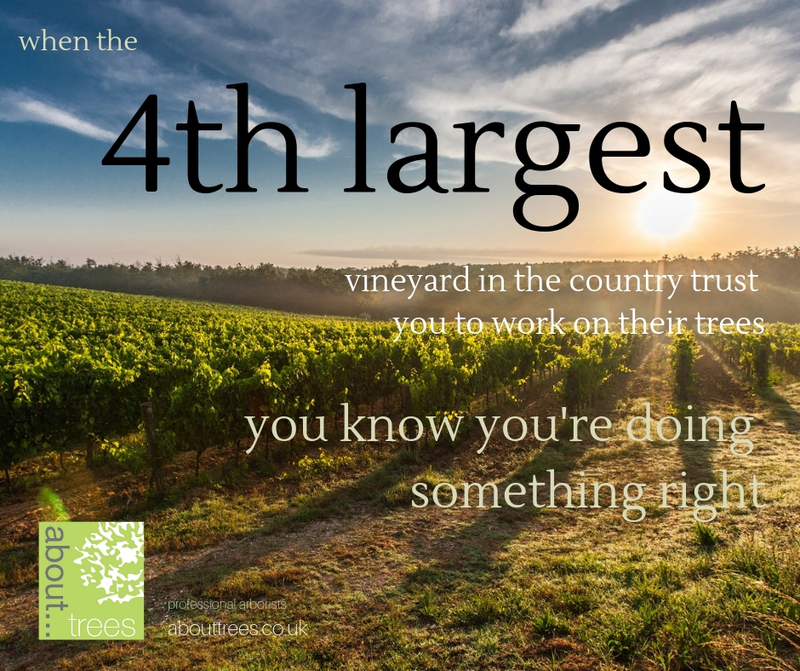 To be asked by a vineyard that is the 4th largest in the country to help them out with their tree management issues. Like us all grapes enjoy the sun, and also like a lot of us they do not like the wind. Trees are planted as shelter belts to stop the wind from damaging the valuable crop. After time the trees on this site had become too tall and had started to affect the amount of sun hitting the fruit. Time to fell the trees? No, time to retain the old Alders but time to manage them also. Alnus spp. are pretty hardy trees and will re-genreate from fairly hard pruning. So that’s what we are doing. We are carefully reducing the height and spread of these trees so they can be of benefit to the crops and even the local wildlife. You know you are doing something right. It’s a good idea to book now for April and May folks, the diary is bursting, the lads are working weekends. 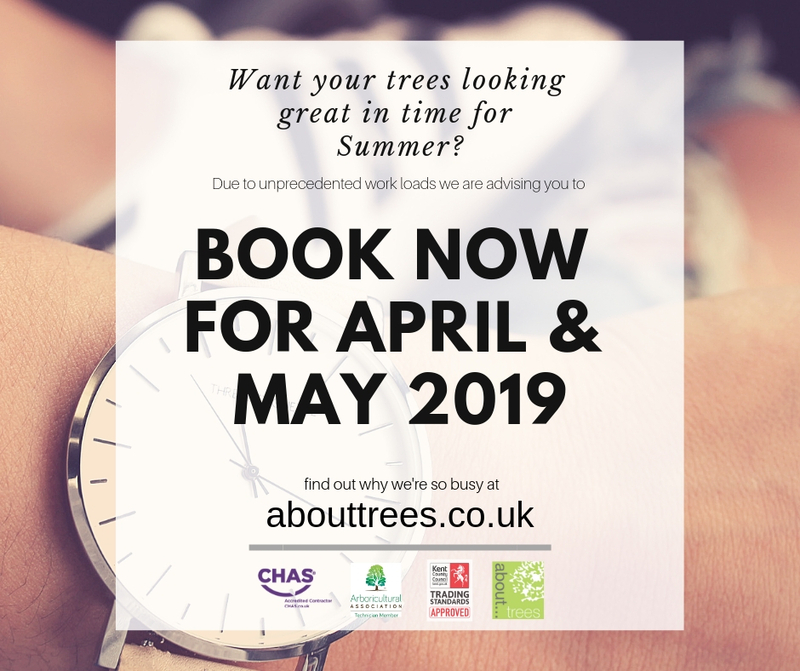 If you need your trees looking at before Spring and Summer better get us booked in for April and May. That’s right, people know that if they want us to carry out tree surgery for them, they have to book ahead. Not blowing our own trumpet but…. People have released that when accompany is Trading Standards approved along with Checkatrade members that we are a serious company. We are serious about trees. We are serious about our clients and we are serious about being professionals. Oh yeah, we are also a CHAS accredited cpm any. This means good practice is at the forefront of all we do. 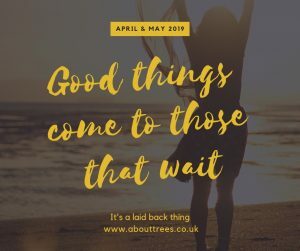 It does mean that sometimes you’ll have to wait for us to get to you but you know the saying – “good things come to those that wait” That’s no hardship though, I can come and visit you way before then. We can chat about the trees and get a plan in place for later on. It’s all pretty laid back actually – just the way I like it. Let’s do this in a typically non-English laid back style, this is Arboriculture – About Trees style – no pressure, just good old honest advice. It’s your call. Yes, it’s true that following spec handed down by well qualified consultants isn’t a big deal at all. Sometimes, however it does’t make for an easy time. This is when other – no so committed arborists and companies interpret the spec. in their own way. Generally with a view of speeding things up and making them easier. The spec. really reinforced the mantra of need a tree surgeon that can follow spec. This TPO’d tree (indeed the entire estate is TPO’d pretty much) was to: Reduce crown of tree by cutting back from branch tips by 2-2.5m ensuring wounds are no greater than 75mm and a even leaf density is left upon completion (paraphrased). Not a simple as it sounds. This was a lapsed pollard with cavities, dead wood and generally all the stuff that make tree climbing difficult present. There was not an option for a MEWP as access was tight and the ground conditions (tarmac) was questionable. Rope and harness time then. Yes, Arborist Dan climbed the tree using double and single rope technique and managed to ensure that he pruned the tree to spec. to growth points. He insured no cuts were greater than 75mm and that an even density of growth was left upon completion. Out of interest the dense area to the bottom right is another tree behind the one we worked on. True…. grinding stumps may not be the most glamorous area of Arboriculture but it is a very necessary one. 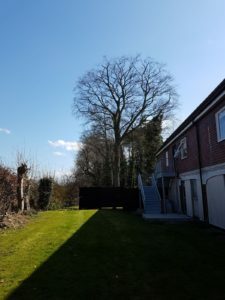 But we at About Trees Ltd are really excited to be able to carry out Stump grinding in Kent moreover we cover the entire county and also neighbouring ones too. So, if you have the need for stump grinding in Kent , Essex, East & west Sussex we can help. It’s a very specialist piece of equipment that cuts away the stump that is left behind when tree is cut down or felled. 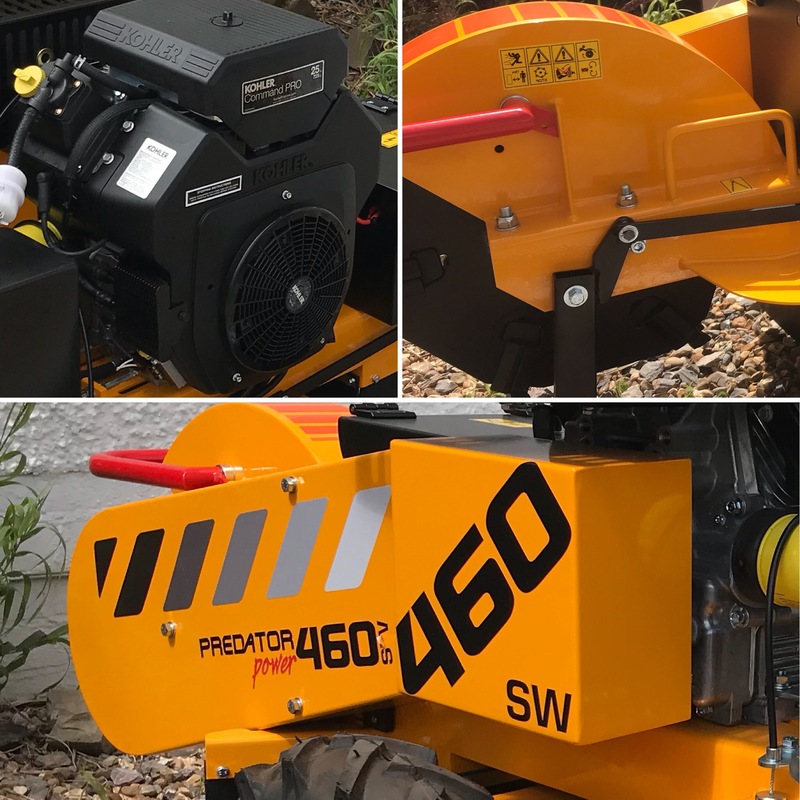 As you may know we carry out Tree Surgery throughout the entire county and now we can advertise Stump grinding in Kent as part of our services. This means we keep every aspect of our work in house. Just how it should be. Just think, you can re-plant where that old stump was. Maybe you keep hitting an old stump every tie you cut the grass, have the stump grinder in and solve that problem. How much access do we need? After much deliberation it was decided to get the best machine that we could guarantee us being to help the most people out with. We ended up getting a machine that only needs 7500mm or 29 inches for access. That’s most garden gates. Job done! Well, most times we are already on site having just completed the tree felling, this means we can keep our costs low. Obviously every job is different but prices start at £50. That’s pretty competitive we think. As always our quotes are free and non-obligational, so why not just find out how much it’ll cost. Being professional Arboricultural company is not always easy. For me I want to build a brand that it respected and acknowledged as being educated, honest and safe. In my head, it’s the kind of company that I would engage with if I came across it. We all shout from the roof tops that there is no place for cowboys in our industry, yet why are there so many companies, firms, set-ups wanting to still cut corners, beat any written quote and essentially not know their industry. I had this situation yet again this week, chances are I did not get a slightly abnormal job for being too expensive. It sound as if it is but I promise It’s not sour grapes….honestly. Ultimately I suppose it’s frustration. Frustration in trying to compete with people that don’t know the dangers present. Frustration with the “we’ll beat any price” adverts. Frustration with most tree work being viewed as a uninspiring purchase to the tree owners. For many folk paying to have their trees worked on is up there with washing machine purchases. I focus my efforts 100% on quality, from the second I arrive at a prospective job to the second the team leaves the completed job site tidy, clean and no mishaps. It has proven to be a good approach. I think potential clients are already expecting us to be on the higher side of the 3 quotes that they may obtain – it’s where I want us as a company to be if I’m brutally honest. Our literature is clear. concise and full of decent imagery, I spend money (quite a lot) on this website, SEO, social media – we are easily found on several platforms. They can review us as a company online on Facebook, Google and Checkatrade. The trucks are kept clean, they are nicely sign written. The lads turn up in branded clothing, with a decent risk assessment and job sheet. Tools are up to date, new and well looked after. The quotes that are provided are clear, informative and I’d like to think get the point across that the potential client is dealing with a company that really does know what they are talking about. It’s all carefully crafted in a hope to win us more work. About Trees is accredited & approved with various quality and health & safety monitoring companies. We should be viewed as professionals and as such we should be able to speak with a bit of authority and… well yes demand a price that reflects this. My wife of nearly 15 years is in marketing, I’ve heard all of the techniques and theories going over these years. This is my favourite one I think. Where we aim as a company to be is YELLOW high quality part of the triangle. We stray into the ORANGE section quite often too. This is where I think as professionals we should be, foolishly its also where I imagine my potential clients would like us to be. 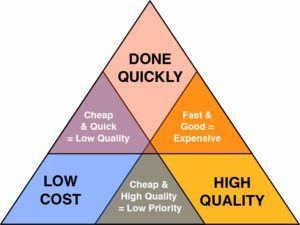 Problem is for a contractor like us this is not sustainable, you can have it cheap, but the trade off is the priority and the quality. For me the relevance is, we can’t or rather, I’m not willing to provide high quality at cheap prices and high priority and I find it hard to understand why someone would. I still think there are customers that want high quality and are willing to accept that it comes at a reasonable price – not even high. This I view as being the most professional approach I could offer. This tree is not a climber. True I had a long climbing career, and in my younger days would have attempted this. Most likely I’d have been lucky and the dead stem wouldn’t have failed. But we know more now, we have more tools under ours belts now, and access equipment that can get into rear gardens. At the very least legally we have to be more careful. What I’m saying is there are options, old fashioned ropes and harnesses are not alway the go to approach. BTW straight felling of this tree I believe is not an option. It’s pretty much touching the gravel board and panels behind. It has quite some weight over the rear side. And characteristics of the wood are so compromised that it would be a guess as to where it would go. After weighing up the site, condition of the tree etc. etc. a quote was emailed off to the client (potential). 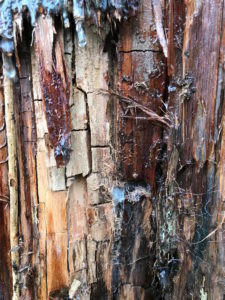 It pointed out the nature of Brown-rot – the removal of Cellulose and Hemicellulose from the wood structure, the risks this posses to both the tree and traditional climbing techniques and so on. 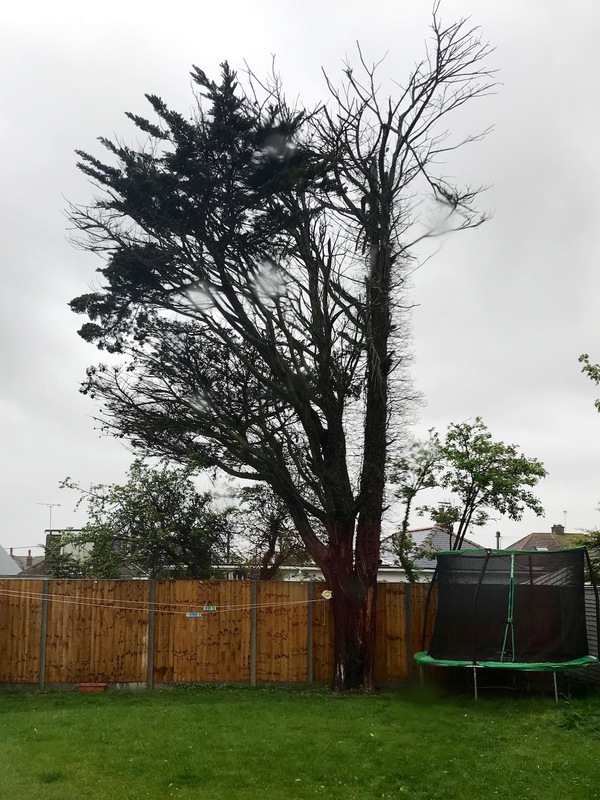 The price I gave reflected the hire of the MEWP our own IPAF qualified Arborist, 2 grounds members, tree dismantled with care and control and all arisings removed from site. The price was £680+VAT. It was deemed too expensive, I know the prospect will get other quotes that will be less than ours, I know that there is a high chance they will not know or even notice the tell tale signs of Brown-rot. I’m also pretty certain there will be a climbing arborist up this tree. There’s every chance he/she will be lucky the tree will come down perfectly well and everyone will ask why About Trees decided it was dangerous and provided such an over inflated price. It’s not an over inflated price, it’s a price for a professional approach based on professional knowledge. I’m not willing to rely on luck. That’s my lads up those trees. They have children, I’m not taking the risk. That’s why I’m sticking in the YELLOW high quality side of the triangle. The question remains – How do we make our industry and all the professionalism it brings on a par to a Smeg refrigerator? 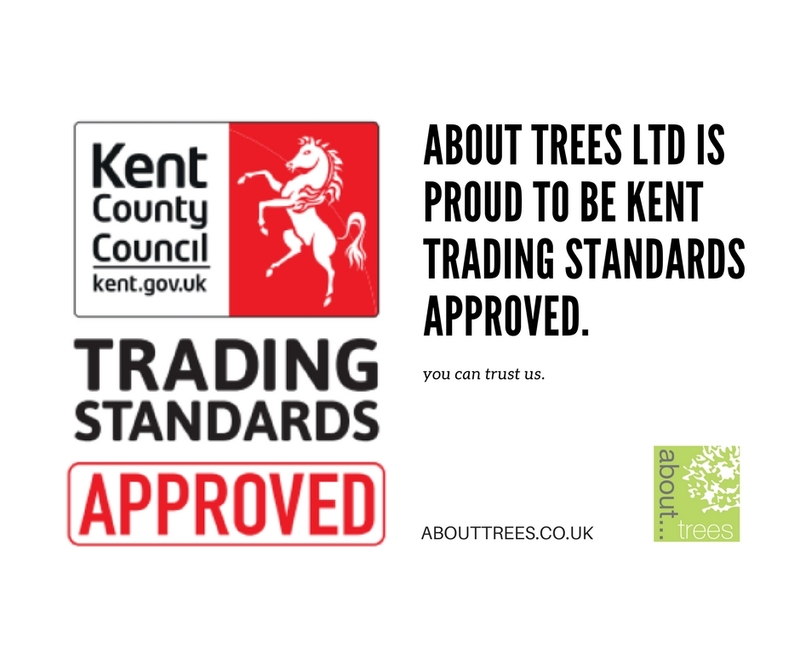 That’s right, About Trees ltd is proud to be Kent Trading Standards Approved Tree Surgeons. This means we have been closely vetted and awarded approval. For you this is peace of mind, you know that we are safe, responsible and criminal conviction free. You need to be confident that the team you have working for you are trustworthy and decent people. They review our insurances and qualifications alongside DBS check (criminal records) and depending on the outcome offer you approval or not as it may be. I feel this is very important, there are, as in all trades lots of cowboys out there. The more we can do to make people’s minds rest at ease the better, accreditation is key. So, now we are Kent Trading Standards Approved Tree Surgeons and also a CHAS accredited company. I’d hope this shows the commitment to being professional, safe and trustworthy the About Trees is willing to make. We are certainly not into this for the quick buck. About Trees is proud to be a Checkatrade approved company. This is what they check. An interview carried out by Checkatrade at the trader’s home or permanent place of work. Rigorous background checks carried out by Trading Standards, including a review of confidential and restricted information supplied by external organisations, other public authorities and the police in addition to checking information that is freely available to the public. Advice on and commitment to use correct documentation for example invoices, contracts etc. A Criminal Background Check of the owner / responsible person of the business. Well, what is decent tree work specification ? In my view it’s when you look at the tree in question holistically. Look at the tree itself, it’s surroundings, the impact it has on its locality, both positive and negative. It’s when you speak to the client or owner of the tree, you listen. You draw from years worth of practical and intellectual skill. Hopefully all of this combines to the end result being the correct tree work specification. John carried out a sonic test of the tree, this showed him and us if any issues were present in the tree itself. Think “Tree X-ray” and you’re not far off! To everyone’s surprise this outwardly healthy looking tree – it had a full crown, very close to no deadwood present and full of vigour was under attack. The Picus test showed a cavity in the main stem indicated by an area of low sonic velocity. 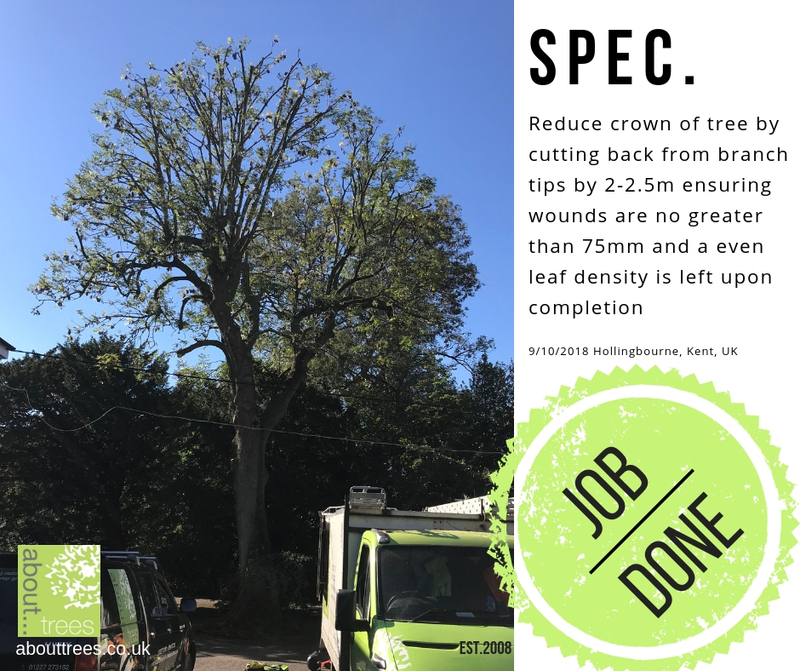 Leading arborist Joe carried out the task of pruning this tree, he used his years of experience to get to the correct points in the tree and carry out an incredible job of executing the spec to the letter. I think you’ll agree the quality here shines. 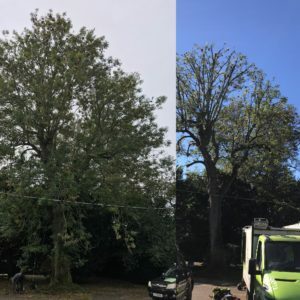 We are often told as Arborists that the sign of a good job is one where the results are natural and hard to see where intervention has taken place. In this case both boxes are ticked. Even the sun came out! It’s the time of year that is most anticipated, we’ve got through a very difficult Winter, we’ve endured The Beast from the East – twice. Finally we can say Spring is here. I love the first flush of blossom usually Prunus spinosa – blackthorn, followed closely by Crataegus monogyna – hawthorn. The hedgerows suddenly become a riot of colour. The birds start singing. Such a welcome return. Our phone also starts getting busy as people start to venture back into their garden. 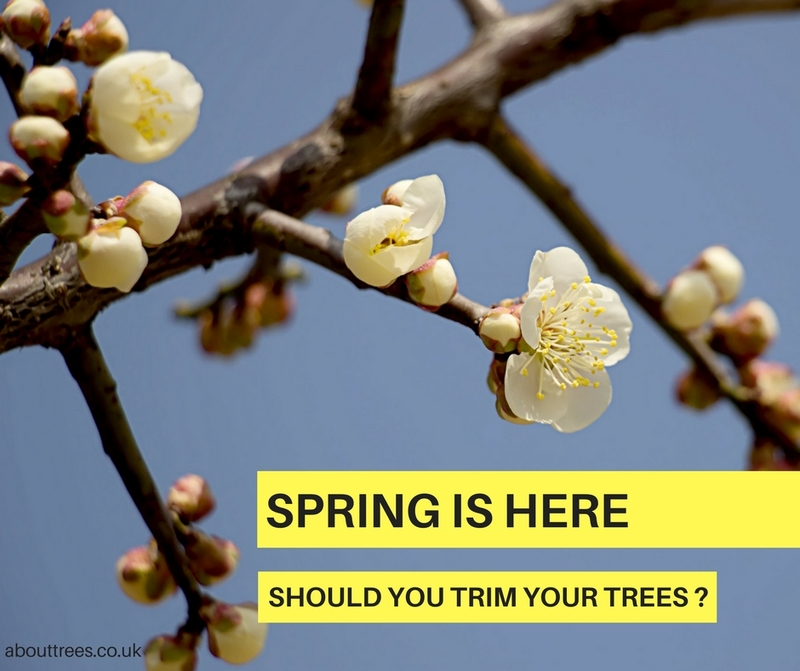 But is it the right time of year to prune your trees? All decent tree surgery companies or stand alone Arborists should refer to British Standards (Bs 3998 2010) when specifying tree works. The scheduling of pruning is down to the Arborist to suggest. Clearly sometimes there are constraints in place that remove the “perfect world scenario”. For the most though we can as the professional suggest if the scope of works the client wants is suitable during springtime. Or indeed any other time of year. The effects on the tree of both seasonal factors and weather conditions should be taken into account before pruning is undertaken. This is the Arborists time to shine! He or she should adopt the mindset of avoiding work that would adversely affect the structural integrity and sustained growth of the tree in question. So, spring is here. What’s the score? Ideally as a general principle for maintenance of vitality, trees should NOT be pruned during SPRING GROWTH. 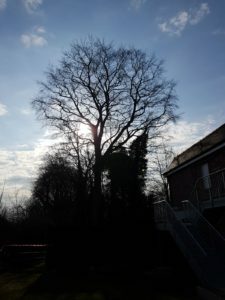 It’s best practice is to avoid pruning trees as they are coming into leaf – trees drain their reserves of energy (carbohydrates) stored within the wood to produce new leaves. Pruning trees at this time results in reserves being further depleted. Their wound response creates chemical barriers to wall off internal compartments within the wood to resist the spread of decay. This leaves them more vulnerable to pathogens and less able to produce vigorous and healthy new shoots. Obviously some trees are pruned at this time, and most do not immediately decline or die, but the older the tree or the poorer its condition the more likely there is to be an impact on its health, vitality and resistance to disease in the long term. 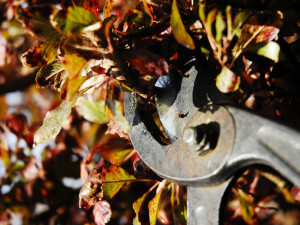 Once fully in leaf (new leaves have fully opened & matured) it is perfectly acceptable to prune – the next time to avoid is when trees prepare for autumn, as they are then using reserves to wall off their leaves, which leads to leaf fall. As a note they should not also be pruned during periods of water stress. Well, we need to halt pruning until the new leaves have fully expanded and matured, or starch reserves have been replenished. Obviously, there are always exceptions to the rule, this is also down to the Arborist’s expertise to advise the client as to which species these amy be. Essentially, as always it’s a gentle balancing act between the wishes of the client, the health of the tree and offering honest professional advice. 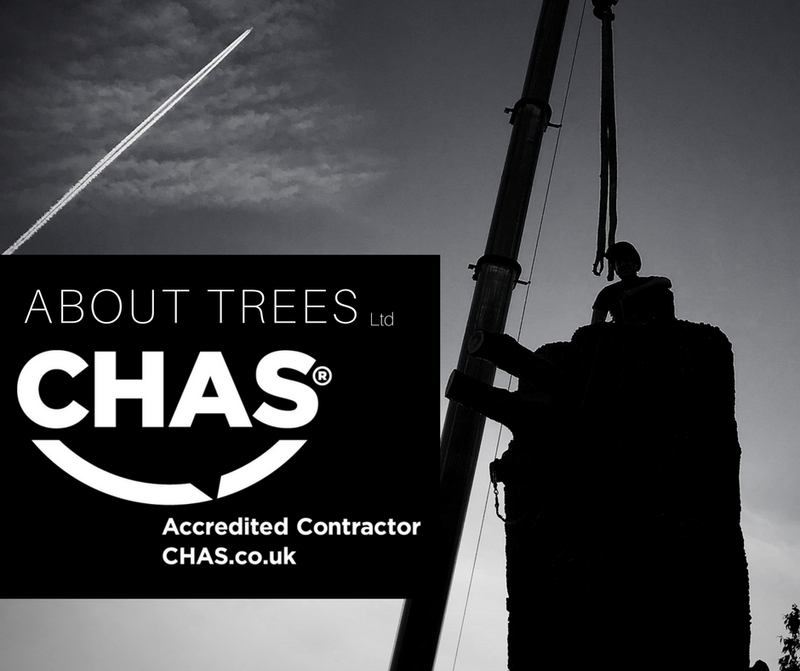 What does it mean to be CHAS accredited tree surgeons in Kent ? Well, it’s simple really, it means that we as a company have had our Health & Safety fully audited by an outside company. They have deemed the measures we have in place to be sufficient to be awarded an accreditation. It’s great news for us, and I hope it shows you our commitment to safety and decent working practice in this very dangerous field of work. Chas needs to see a wide range of documents and paperwork. Insurances both Employers and Public liability, H&S documentation, First aid training. Proof of qualifications held, COSHH documentation and much more. In short I will be honest and say it doesn’t alter the way we go about our daily tasks too much as most of the systems we had already in place. You won’t notice too much difference in our approach. What it does do is show you our commitment to or staff, their safety and value to us. Hopefully this means something to you – after all it’s good to be valued isn’t it? It also makes your life a little easier if you are a commercial client – contracts manager etc. as you know we are fully compliant and ready to go for you. It also makes your life a little easier if you are a commercial client – contracts manager etc. as you know we are fully compliant and ready to go for you. The burden of paperwork is removed from you, we are CHAS accredited, that’s what you need to know – happy days.